Do You Have a Little Biter? I’m lucky. Neither of our daughters were biters. Well, I take that back. Both of them tried to bite me when they were still breastfeeding, but you know what? Mama don’t play that! They learned early on not to bite with a tiny pat on their diapered heinies. But biting for some preschoolers is a phase they acquire and eventually grow out of, but poses monumental problems for parents, especially when their little mini-munchers like to take bites out of other kids and adults. 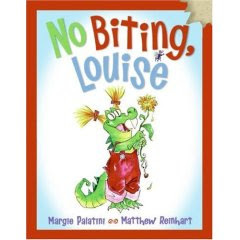 No Biting, Louise (Harper Collins Children), a cute tale about a dinosaur who likes to bite everyone, is an excellent teaching tool for parents to help children understand that biting is not acceptable. With a heart warming, gross (kids will love it) ending, children who bite will see that, like Louise, they do not need to hurt others by biting, but biting into food only will suffice.